I remember the first time I heard the term “Reading Challenges” It was in October, 2009, the year that I discovered book blogs. I was intrigued by the idea of setting reading goals for the year, and I was captivated by the number of different challenge themes to choose from. Since I have never had the opportunity to be a part of book club, I thought this would be a way for me to connect with an online community of like-minded bibliophiles. For the past two years I have signed up for several challenges, but completed very few. And I vowed several months ago that I would not join another one. I like the idea of challenges, but in the end, I miss the freedom of choosing what I want to read when I want to read it. But since returning to the bloggosphere I have once again been tempted. And once again, I will cave in. But this time I truly plan to limit my enrollment to just two – and I have great expectations of completing both of them. The first challenge in which I will take part is not so much a choice but a necessity. I am very much looking forward to taking part in C.B. James’s TBR Double Dare Challenge, which runs from January 1 – April 1, 2012. The premise is simple: read only books that are currently in your possession as of January 1. Do not purchase any new books; do not put any new books at hold at the library. For three months just read books that you currently own. I would say my current ratio to books owned that I have not read vs books owned that I have read stands at about 10:1 (maybe more). It is totally out of control. Although I have not felt like reading for the past nine months or so, that has not curbed by book buying habit. And the guilt is starting to overshadow the pleasure of this hobby. So I gladly join this challenge with the hopes that it will not only help me to make a dent in my TBR backlog – but also that it will jumpstart my old reading passion. 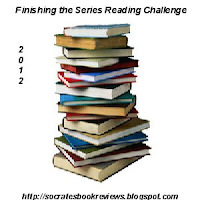 The other challenge in which I will participate with great gusto is the Finishing a Series challenge hosted by Socrates Book Reviews. I have started the Harry Potter series at least three times in the past two years. I originally started them in audiobook form, having fallen completely in love with Jim Dale’s voice – and managed to listen to the first two books while cultivating a treadmill routine (something else that has gone by the wayside lately). Last year I started to read The Sorcerer’s Stone again, but life seemed to pull me in a different direction. At this point I have ‘cried wolf’ so often that my youngest daughter, the Hermione of the Totoro family, does not believe I will ever follow through on my promise to read them. So, in an effort to prove her wrong – and to allow myself the pleasure of reading a beloved modern day classic, I have declared 2012 to be the year of Harry Potter. I currently have in my possession all but the first book in hard cover; all of the books on audio CD; and just recently purchased all eight movies in DVD Blu Ray. I hope to follow a routing of reading the book first (probably combination of audio and written word) and then watching the movie as a special reward. If I weren’t so gun-shy of challenges – I would even consider starting a Harry Potter reading challenge….but I’m not sure that I can pull that off. I am very optimistic that 2012 will be the year that I complete all of the challenges in which I have enrolled. Of course it helps that the two challenges can be completed simultaneously — in that the books I choose to read will count for both. And while it is not overly ambitious — only seven YA books in a twelve month period — it is best for me to start with baby steps. Good luck with both your challenges. I don't participate in challenges either anymore, but I very much like the idea of the one where you only read your own book between jan and april. I have a 2:1 ratio of books not read:books read. My friends lend me books though which I would like to read so im not sure I can really participate. Good luck with your harry reading to. Can I make a suggestion? If you are going to read more of the adiobooks, try the Stephen Fry narration.I have listened to both versions and Fry's is much better. 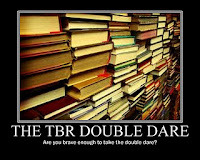 The TBR Double Dare Challenge should be a good one for me. I have so many books that I've purchased buy haven't read yet. Have fun! I haven't picked my challenges yet. The first challenge would be a good one for me as well. I have so many books that I haven't read, it's not even funny. However, I do feel that challenges put me under pressure, and then all the joy is gone. But I should still try and read those books instead of buying new ones! Welcome to the Finishing the Series challenge! Hope you have fun with it. Have fun with the challenges, Molly. I only joined two also and they are geared to getting books off the shelf. It's out of control here too. Pleasurable addiction,though. Good luck with your challenges, Molly. I'm looking forward to taking the TBR Double Dare again and have decided to do Bellezza'a Venice in February. I think you're going to do fantastic with those two challenges. I only signed up for one and that will be to read from my own shelves!! Imagine doing that??!! LOL! Good Luck in 2012! I fall into the same temptations – all the challenges look so appealing, but then I don't follow through. This year, my only challenge is the Outdo Yourself challenge – which is to read fifteen more books than I read in 2011. Good luck on your challenges – they seem like wise choices. I've got "Read the Harry Potter books" on my goal list, too. But honestly, not sure I'll really ever start it. I really started noticing challenges in 2009, too. In 2010, the organization of my challenges was chaotic. My 2011 list worked out better….but in the New Year, I plan to limit my challenges. I've signed up for four so far. Reading TBRs is one of my challenges.